When the air smells bad, and the water tastes awkward, you know something is wrong with them, and most probably they are polluted. While many people have traded the safety and cleansing power of activated charcoal for all kinds of poisonous air sprays and dangerous municipal water supplies, activated carbon can save your life now as well as in the future. You can make activated carbon at home, if you have proper tools and materials. This substance has a lot of uses, and air and water filtration is on top of them as it offers the widest range of protection against a range of chemicals. Read the following article and learn how to deal with it! Step 1 – You will need wood or some other dense plant fiber to burn. Hardwood, coconuts, or just about anything else that is porous and will burn well can be used for this purpose. Make sure the material is as dry as possible before burning it. Step 2 – Put the material in a pot and cover it. The pot should have some ventilation holes in it, however the flow of oxygen should remain limited. If you know how to make tinder cloth, then you can use a similar process for making charcoal. Step 3 – If you have a campfire going, set the pot on the fire. The temperature will have to be hot enough to cause the material within the pot to burn. Your goal is to burn off everything but the carbon. It may take several hours for this process to complete. During that time, you should see smoke and gas escaping from the pot. Step 4 – Let the charcoal cool, and then rinse it to remove any ash or other debris. Step 5 – Grind the charcoal into a powder. As you get better at making activated carbon, you can try leaving it in small chunks. Remember that later on, the charcoal will need to be saturated with a chemical that will increase pore size. If the chunks are too large, you may not achieve this goal, and the resulting activated carbon will not be as efficient or as effective. Make sure the charcoal from Step 5 (this step) is completely dry before mixing it with anything else. Step 6 – Next, you will either need bleach, calcium chloride, or lemon juice to turn the charcoal into activated carbon. Of the three materials, calcium chloride can be made from natural resources as long as you observe some basic safety precautions. To make calcium chloride, work outdoors or in some other well ventilated area, and wear goggles, safety gloves that are resistant to acids and other chemicals, and other protective gear. Start off with hydrochloric acid (you can obtain this from the stomach of any animal you have hunted and refine it from there) and limestone (your main source of calcium carbonate). Put the hydrochloric into a glass beaker, but don’t fill more than ¼ of the vessel (some people go as high as half. It is best to start with small amounts until you are more sure of how the chemicals will react to each other). Carefully pour calcium carbonate powder into the hydrochloric acid until the solution stops bubbling. Once the reaction is complete, pour the solution through a strainer so that any lumps are removed. Next, you can heat the solution to remove any excess water. The powder left behind is calcium chloride. Step 7 – Next, mix the material you choose from step 5, and combine it with 75% water. Step 8 – Pour enough of the mix from Step 7 into the charcoal so that the charcoal is completely covered. Step 9 – Let the charcoal sit for 24 hours. Step 10 – Drain all liquid from the carbon and rinse it to remove any stray chemical left behind. Step 11 – Remove as much water as possible. The charcoal should be wet without being completely saturated. Step 12 – Place the charcoal back in the metal pot and let it cook for about 3 hours. If the fire is hot enough to boil water, it will be just the right temperature to finish converting charcoal into activated carbon. 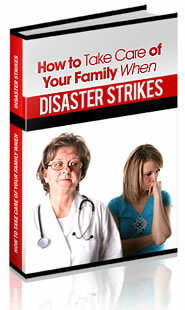 Contaminated water after an emergency can put your family at risk. Protect them now! Do you ever notice that when you travel to certain areas, the air smells really bad? Do you also notice that this sensation seems to fade after a few days? The air around you is so dirty it is probably making you and your family members very sick even though your nose had adapted to it. Aside from carbon monoxide, automobiles also release other dangerous chemicals into the air, and some of them are known to trigger asthma and other breathing disorders. Medical waste and rubbish dumps release dangerous chemicals into the air. If you smell something bad in the air when downwind of a dump, then this is the natural gas released by the piles of garbage. The dump may also be releasing all kinds of chemicals created when trash mixes together and new substances begin to form. You can’t tell just how many of these substances cause cancer or other health problems simply because you inhaled the disgusting odor of rotting trash. Factories and power plants also release volatile organic compounds and other chemicals into the air. You may be able to smell some of them, while others are odorless. If you spend the money and time to build an air quality sensor capable of detecting specific chemicals, you’ll be amazed at how dangerous the air around you really is. It will get much worse after a crisis because of increased numbers of fires and a lack of tools, labor, and resources required to manage dangerous chemicals. Activated carbon can be used to remove most volatile organic compounds, and many other chemical based contaminants from the air. In fact, if you suffer from chronic medical problems, you might need a pre-fabricated carbon filter attached to a fan or some other source of air flow. Aside from cleaner smelling air, it will ease your health problems. If you are concerned about gas attacks or other social collapse related scenarios – these kinds of filters will be essential if you plan to stay in your home. While there is much more to prepping for an air quality related disaster, activated carbon filters are a good place to start. There are a number of furnace filters available that have activated carbon in them. In most cases, these are little more than a liquid solution of activated carbon added to the filter media. You can try experimenting with your own versions to see if you can get a filter that effectively removes odors (and therefore their cause) from the air. Even if you could seal off your home entirely from the outside world, it would not be a feasible option. Gases and bio weapons will easily seep through even the tiniest crack and can be devastating, and there will also be times when you have to leave your location. And if you are away from your bug out location, you’ll need to protect your lungs as much as possible. These are reasons why making and wearing a viable gas mask or respirator is very important. As with air filters, activated carbon offers the widest range of protection against a range of chemicals. Considering the rising rate of smog and other air pollutants, activated carbon masks are also very important for improving and maintaining a reasonable level of health. In fact, in many Asian countries, people don’t go outdoors or exercise without wearing an activated carbon mask. While this is a fairly rare sight in the United States, those who know the truth are doing the exact same thing. If you have asthma or other chronic breathing problems, even a surgical style mask with activated carbon in it can make a big difference. I have personally noticed a 50% reduction in noxious odors from insecticides, smog, and other fumes when wearing this kind of mask. Others that have tried them notice a 70% or better reduction. While I have not tried the wrap-around designs more common in Asian countries, I suspect they would be more effective because they would seal off the areas where I tend to get the most air leaks. A surgical style activated carbon mask is better than nothing, however you will need a more robust respirator design for gas attacks and other dangerous situations. You can try making them from soda bottles or purchase one made for this purpose, as you see in the video below. Just remember to practice breathing with these masks, and they can and do restrict air flow. Also make sure you keep the mask clean and change the cartridges on a regular basis. As good as activated carbon is at filtering out many kinds of chemicals, the pores in it still fill up quickly, hence the need to replace the cartridges often. You can and should try taking used cartridges apart to see if you can find a way to refill the activated carbon part. Even if you cannot obtain or make the other filter media, at least you may be able to keep this vital part of the mask working for a longer period of time. As a prepper, you may already be giving a lot more thought to water quality than air quality, but activated carbon isn’t only useful for removing the bad taste from water after it has been boiled. That bad taste is an indicator that the water isn’t as clean as you think it is. Boiling water will kill off bacteria, however it will actually cause an increase in the concentration of heavy metals, pesticides, and even dangerous drugs that have leached into just about every potable water supply at the surface level. While activated carbon will not remove all heavy metals, it is excellent for removing most other dangerous chemicals and drugs. Typically, filtering water with activated carbon is a lot easier than filtering air. At the simplest, just add some activated carbon to a clean sock and pour the water through it. You can also make your own cartridges and add a pump for larger volumes of water. When designing your own system, don’t forget to make it easy to change the cartridge as well as detect when it needs to be changed. Since many water quality issues reflect in changes in pH, you may want to try building a pH sensor into your system so that you know when to change the filter. As you can see, making activated carbon isn’t especially difficult. No matter whether you are concerned about improving your health and lifestyle now, or want to do as well as possible during and after a social collapse, activated carbon should be a household staple. Even if you get started by simply buying products with activated carbon, it will give you a chance to see how useful it is before you delve into making your own activated carbon exclusively from natural resources. Once you acquire this skill, you will be well on your way to managing a number of emergencies that may not be as high on your priority list as others. Nevertheless, when the situation demands, at least you will have something on hand to deal with it.